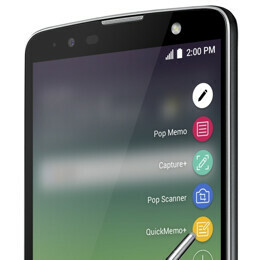 LG just unveiled a new, extra-large Android 6.0 Marshmallow smartphone called Stylus 2 Plus. As you may have guessed, this is an upgrade over the LG Stylus 2 (aka LG Stylo 2) - a handset that was released not long ago in the US, currently costing under $200 off contract. The LG Stylus 2 Plus looks pretty much like the Stylus 2, having the same dimensions and weight: 155 x 79.6 x 7.4 mm and 145 grams. However, the new device comes with many improvements. For example, its 5.7-inch screen is a 1080p one (much sharper than the 720p 5.7-inch display of the regular Stylus 2), while its processor is an unnamed octa-core one clocked at 1.4 GHz. There's also more RAM available (2 GB, or 3 GB - depending on market), while the rear camera is a 16 MP one. Another notable addition is a fingerprint scanner (located on the back of the device). The Stylus 2 Plus offers 32 GB (or 16 GB - again, depending on market) of expandable storage space, and includes a 3000 mAh removable battery. Needless to say, a stylus pen is also on board. All in all, it turns out that the Stylus 2 Plus is the LG K535 that we initially thought would be called LG K11 or K12. The LG Stylus 2 Plus is available starting this week in Taiwan, and will be released in other markets (including North America and Europe) in June. LG didn't say how much the smartphone would cost, but we don't think its price will be higher than $300 off contract. Any buyers? Nice specs for a midrange phone with midrange price. Lol..buy a Note 4 than this. Only consolation is the upgrade after Marshmallow. Note 4 price is 518Eur. LG 269eur. Well if your saying Note 4....at that point get a better phone than that at the same price. From my experience, only LG's flagship offerings are worthy of purchase. Their mid and low-end offerings have serious compromises on processing power, camera and display. Though they've put a 16 mpx camera in this one, I really doubt if it's any better than the one in LG G PRO 2, which btw is a GREAT phone! Pic 3 looks exactly like a Note. *Cough* zenfone 3...... It was all good until I saw $300... I'll pass But then the chipset is unconfirmed. It's probably the 616 or 617 or a mediatek.